myForesight® and UTHM has jointly organised the Foresight Club participated by 24 selected student of Technology Management, UTHM. The event held on 21st and 22nd of February 2013. This programme is one of a workshop series scheduled in 2013 under the Outreach initiative to promote Foresight methodology in youth. 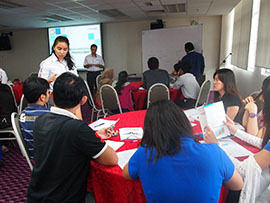 The participants were selected by their supervisors for Projek Sarjana Muda 1 (PSM1) programme, whereby the students will apply the foresight methodology and processes into their PSM1. The objective of the programme is to prepare the students for their PSM1 that is expected to be delivered in 12 months.The 2-day programme focuses on understanding Foresight, Foresight methodology, practical case studies, examples and experiences. Throughout 12 months project, myForesight will be monitoring and assisting the students from time to time. The programme received a very encouraging response and the students are challenged to deliver the best PSM1 project based on creativity, analysis, presentation, realistic, source and efforts of their own project. .